another pinterest board + phone consultation success story! 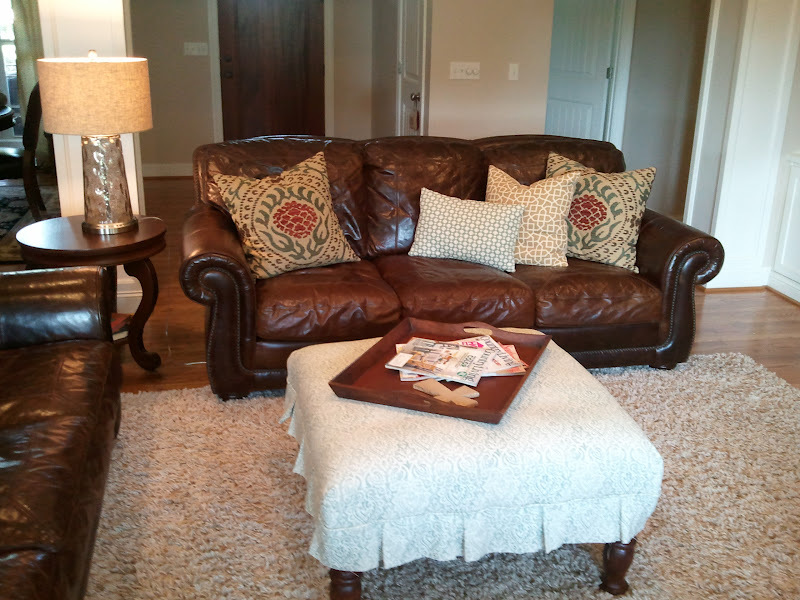 the two leather sofas, the new chairs from overstock, the woods side table, the ottoman and rug. my client felt that the room lacked personality and she wanted to add some subtle color. the current drapes were actually patterned drapes that she had tired of, and so she hung them inside out. 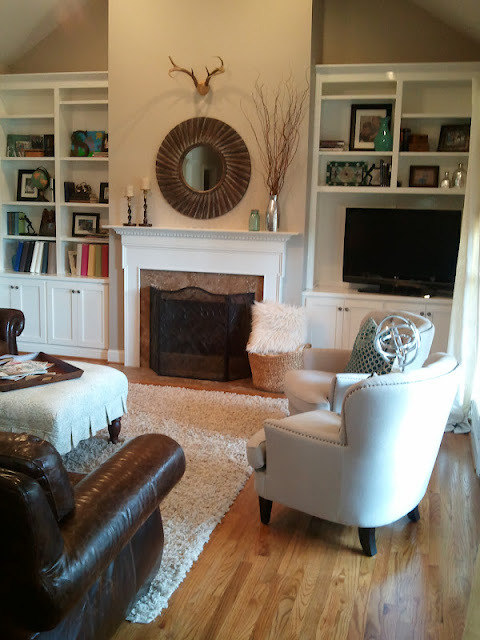 she wanted some quick updates that would freshen up the room, and also wanted my help picking out a new paint color. *changing the wall color to something less gold, yet still neutral. the biggest change is the wall color. we opted for benjamin moore's "stone hearth". 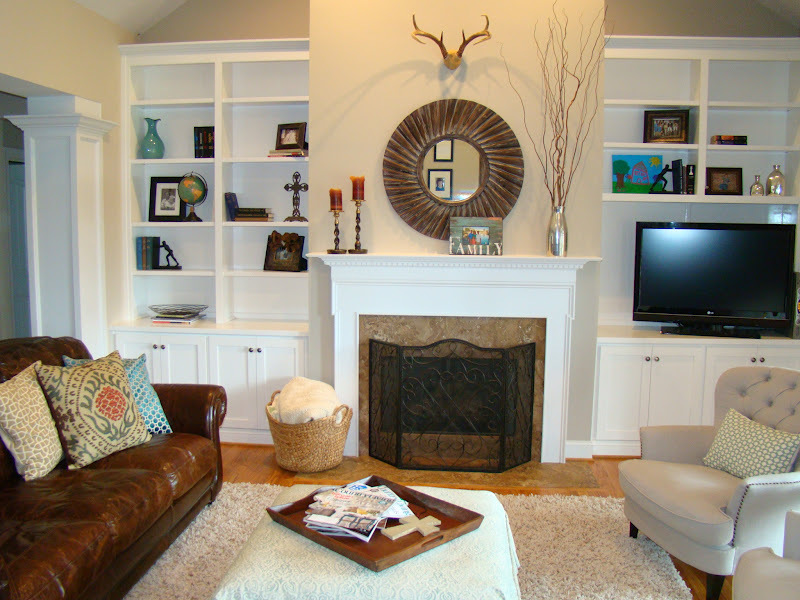 it is a great neutral...less gold yet still warm enough to tie in the other elements of the home like the fireplace surround and the kitchen cabinets. 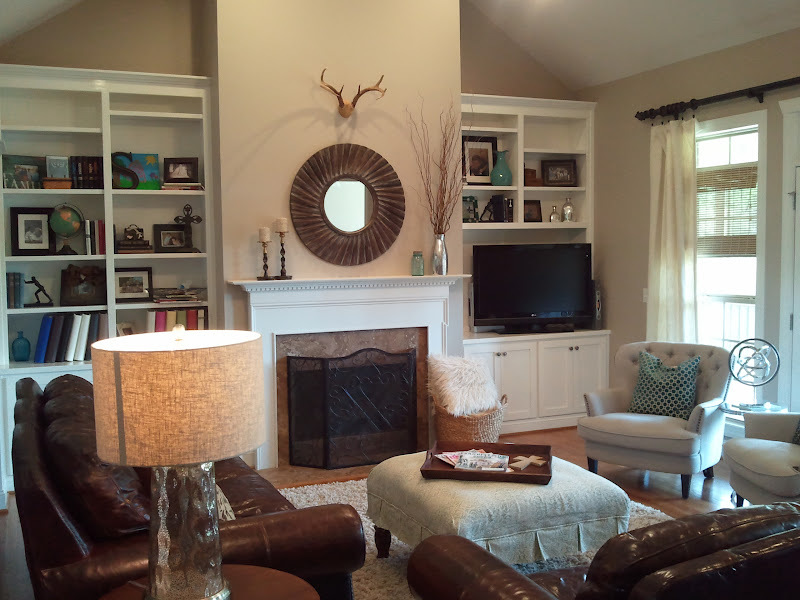 adding the large mirror and antlers the wall space above the fireplace gives the wall so much more presence. 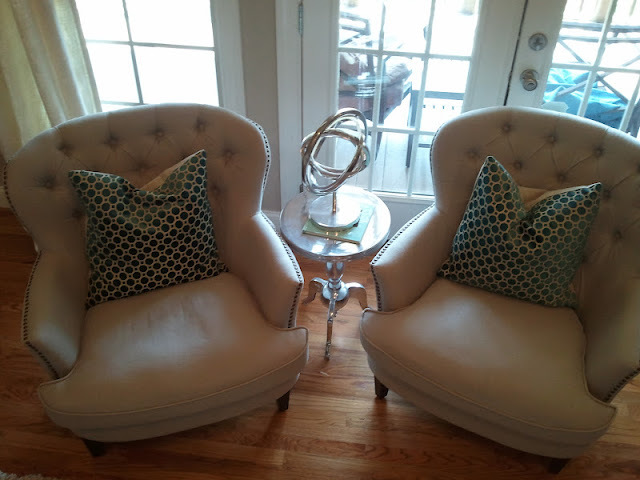 the pillows add some color and texture. 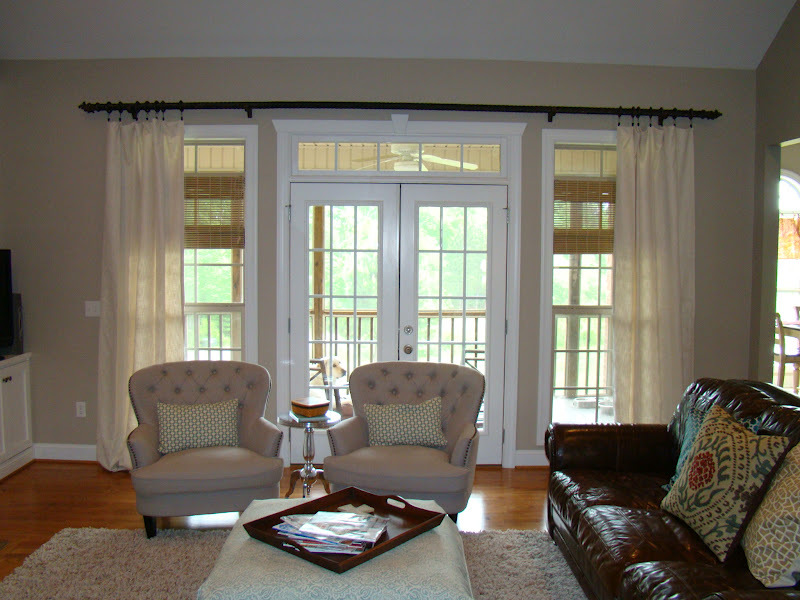 new drapes, and a new table (the alu accent table from z gallerie--one of my favorites) make the room feel more polished. can you spot the pleating detail in the edge of the slipcover ottoman? 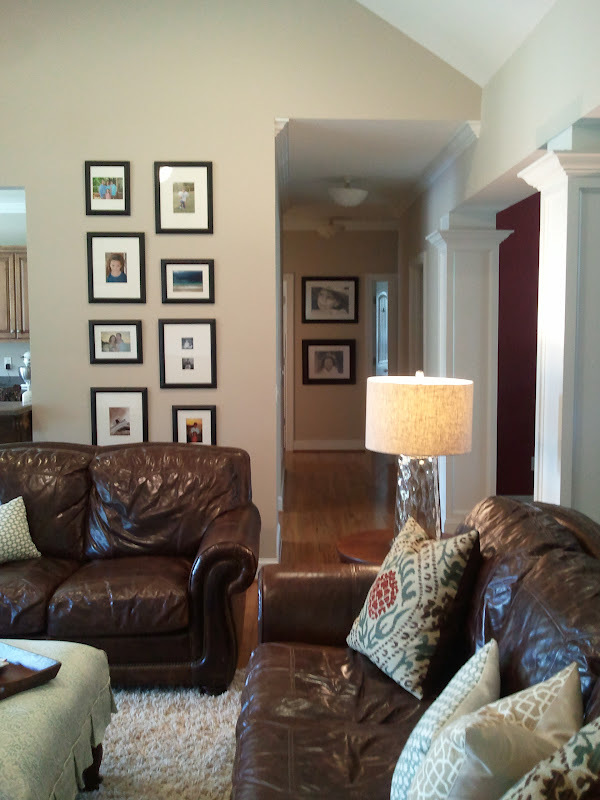 the new photo gallery takes advantage of the wall space better than the single frame that was there before. 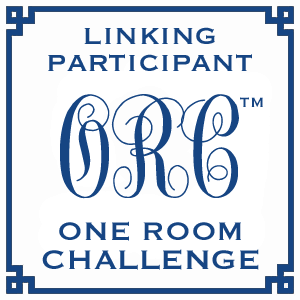 are you interested in working together on a room in your home? 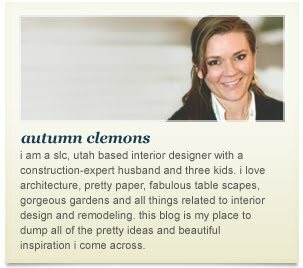 i am taking clients for full room designs for the end of october, but i have room for one more pinterest board + phone consultation in september, and several more in october! I may be interested - i "love" my livingroom but it needs something... what is the cost for this consult? hi deb! the fee for a pinterst board + phone consultation is $150. you can read a little more about this and my other services in my "seervices" tab! drop me a line, i would love to work with yoU!! Nice job of making the fireplace wall a good focal point and soothing color.